The Decision 1 is one of the last S-100 BUS based computer generation. Morrow Designs held it as the most flexible of all. On top of a classical CP/M 2.2 operating system, it also featured a special 8 bits version of Unix called Micronix, which allowed the compilation of many programs written in C for other machines under Unix. The Decision 1�s multi user version allowed to manage up to 15 users and 20 simultaneous tasks. According to Morrow Designs, testing confirmed the Decision 1 was faster than any competing system based on 16 bits 68000 microprocessors. I was working for George from 1979-81 when that machine was developed. 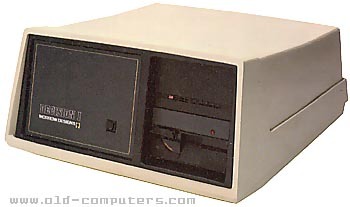 About disk drives, originally, we used a 14" Shugart 14mb hard drive and Shugart 8" full-height floppy drives. We then went to the Tandon 1/2 height 8" drives, then to a 5" floppy drive whose manufacturer I don't remember. When Memorex came out with their 8"-5mb hard drive, we switched to them, then the 10mb version. BTW - the Decision II - or, as we called it, the "boat anchor" - was developed about the same time. This was the under-the-table box that was about 18"wide, 14" tall and 30" deep, as I recall. It was designed to fit in a rack-mount. Al (another Morrow employee at the time) and I installed 28 of these beasts at Micro Pro across the bay in San Rafael. My first job with George was rebuilding and aligning the heads on the floppy drives. Also - the 68000-based systems were what caused the death of Morrow Designs - that and the S-100 buss. We couldn't get reliable speed above 8mHz with an 8-bit buss (Z-80). George toyed with the 8086 but he was steadfastly against a 16-bit OS. At least until after I left in '81. That's something about him I never understood. I still have my original Imsai 8080 chassis with several Morrow S-100 cards. I don't have the drives any more, so the box doesn't run. I do have the OS, however, plus the source-code for the OS. At one point, I was promoted into writing assembly code for these machines. That led to my 27 or so years as a programmer. $7,290 - Three-user hard-disk version with Micronix O.S. see more Morrow Designs Decision 1 Ebay auctions !